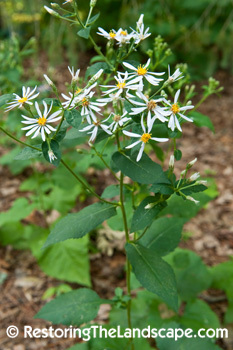 If you're looking for a great shade tolerant perennial native, this Aster is a good candidate. 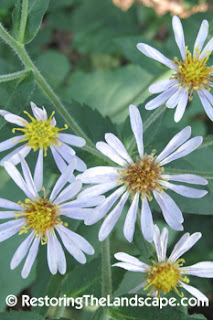 Flowering right now in early August (much earlier than most fall blooming Asters), its light mauve rays arranged in a branching cluster will brighten any dark woodland corner. As the common name suggests, the basal leaves are large and heart shaped, 4-5 inches in width. The flower stalks ascend from these basal leaves to 24-30" in height. This Aster spreads by rhizomes and forms nice clusters. Big Leaved Asters grow in a variety of soils from moist low lying shaded areas to sandy loam soils in part sun. It has been one of the best summer performers in our dry shaded woodland in the backyard. 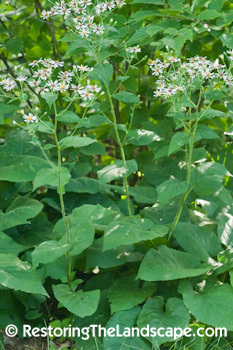 This plant could be utilized more in formal shaded landscapes, massed amongst spring flowering woodland natives. Flowers open as early as mid July and can bloom into October. The seeds are wind disbursed by the fluffy hairs attached to the individual achenes. 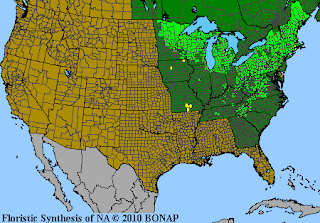 Big Leaved Aster is native to northeastern North America, see map below.